The codename is J.J. 12 апреля 1987 г. Attack the enemy of the high skies 19 апреля 1987 г. The chance is 0.1 second! 26 апреля 1987 г. Trap of the shapeless ninja squadron 3 мая 1987 г.
Apple order violation!? 10 мая 1987 г. Take off, Tricharger 17 мая 1987 г. Struggle till death! J.J. Versus Ricks 24 мая 1987 г. Strike the oceanfloor base! 31 мая 1987 г. Stolen Zillion 7 июня 1987 г.
Flames! Ricks' counterattack 14 июня 1987 г. Birth of new zillion! 21 июня 1987 г. Attack! Triple shoot 28 июня 1987 г. Angry shutter chance 5 июля 1987 г.
Nightingale of the battlefield 12 июля 1987 г. Life Or Death!? Confrontation of fate - first part 19 июля 1987 г. Life Or Death!? Confrontation of fate - last part 26 июля 1987 г. Tears! Let's search J.J. 6 сентября 1987 г. The beautiful noza's challenge 13 сентября 1987 г. Match! Let's throw the coin 20 сентября 1987 г. Kick with a broken heart 27 сентября 1987 г. Clash! The sniper 4 октября 1987 г. Great victory from a lie! 11 октября 1987 г.
Terror! Demon's bio weapon 18 октября 1987 г. Great adventure! Warrior Opa-Opa 25 октября 1987 г. Gentle fugitive Apple 1 ноября 1987 г. Revenge demon ninja! 8 ноября 1987 г. Extraordinary Rebel Ricks 15 ноября 1987 г. Mystery!? 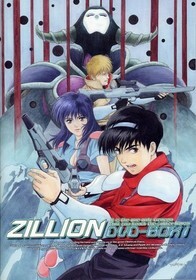 Zillion power 22 ноября 1987 г. Heroic! Ricks dies!? 29 ноября 1987 г. Planet Maris on the corner! 6 декабря 1987 г. Last shoot for victory 13 декабря 1987 г.